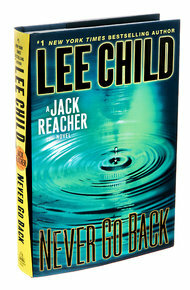 If you know the name Jack Reacher and have read lots (any) of Lee Child’s books, then you might want to join me Tuesday, September 10 at 7 PM in DC to see and hear Child’s talk about his newest book, Never Go Back. For those of you who haven’t had the good fortune to read any of Child’s thrillers, he’s a British writer named Jim Grant (Lee Child is his pen name). His 17+ books featuring the ‘detective’ Jack Reacher are some of the best escapist books I know. Grant/Child’s books have won numerous awards, beginning with his first one, Killing Floor, which won a best first novel award in 1997, and on to his 2012 A Wanted Man which won a National Book Award for Thriller/Crime Novel of the Year. To ‘claim’ the one free ticket I have, send me an email (Samesty84@gmail.com) if you want to/can join me.